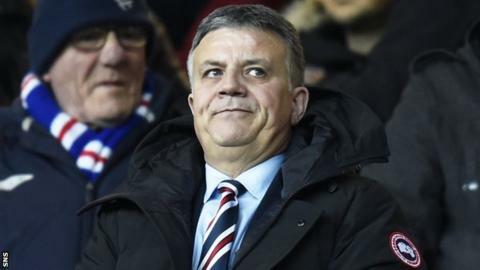 Rangers caretaker Graeme Murty will have a say on January transfer targets, but final decisions will be made by director of football Mark Allen. Murty, who has overseen seven matches in his second interim spell at Ibrox, will remain in charge until the end of December at least. "I'm not involved in identifying targets," he said. "I'm involved in identifying characteristics and areas of the squad we need to strengthen." Murty stepped up from his Under-20s coaching position once Pedro Caixinha was sacked. "Our recruitment department and Mark are looking at targets," Murty said. "They are looking at players with the characteristics required to play for this football club. "We're in daily discussions, but as it comes closer to that time and to individual players, you'll have to talk to Mark because he's in charge of that side of it at the moment in our current set-up. "I haven't been told anything is going to stop us getting a player that we like. "But, similarly, I haven't yet been that detailed with specific targets as yet. "That will just have to take care of itself when January comes." Aberdeen manager Derek McInnes had been Rangers target to take the Ibrox job, but the former Light Blues midfielder rejected their approach last week. Murty conceded that Rangers risk missing out on their top playing targets while they focus on the concluding their long-running hunt for a new manager. "It's possible," he said at his pre-match press conference ahead of Wednesday's clash with Hibernian at Easter Road. "But, to be perfectly honest, I think we're buying a bit of trouble if we get focused on it. "The squad is as it is at the moment. We've identified there are areas we need to strengthen and it's down to the recruitment group to make sure that those best targets are identified. "As or when a new manager comes in, they will be addressed at that time, along with the new manager's targets. "If there is no-one in place, I'm sure there will be other plans put in place to help the squad through what is a busy, busy period."